**"Dissolved solids" refer to any minerals, salts, metals, cations or anions dissolved in water. 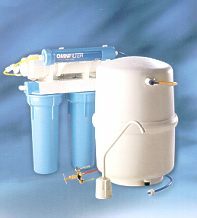 Total dissolved solids (TDS) comprise inorganic salts (principally calcium, magnesium, potassium, sodium, bicarbonates, chlorides and sulfates) and some small amounts of organic matter that are dissolved in water. Removal/reduction of TDS is what reverse osmosis units do best.